“For each battery it replaces, uSTART removes 100 to 500 lbs of lead from the environment, and saves 50 lbs in vehicle weight positively impacting fuel economy." Ioxus, designers and manufacturers of smart power solutions based on its widely used ultracapacitor technology, today announced that it has been named to the 2018 Top Green Providers list by Food Logistics magazine, a publication dedicated to covering the movement of product through the global food supply chain. The annual award recognizes companies whose products, services or exemplary environmental stewardship promote sustainability within the food and beverage industry. As a replacement for a Group 31 battery, the uSTART energy storage smart power solution improves starting reliability and extends battery and starter life, and has jump start capabilities, which eliminates costly and time-consuming roadside service calls for engine starting issues. 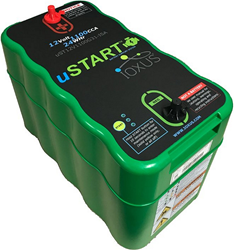 Installed by an OEM or as a retrofit as a drop-in Group 31 battery replacement, uSTART systems are widely used in Class 6 package and other delivery trucks and are now available for Class 7 and 8 day cab trucks and tractors with up to 12-liter engines. Incorporated in 2010, Ioxus is the smart power company that designs and manufactures intelligent power and energy storage technology for transportation, alternative energy, medical, industrial and grid-connected markets. Designed and manufactured in the U.S., the company’s uSTART and X-Series products are based on patented ultracapacitor technology. Ioxus is headquartered in Oneonta, NY, with sales, service and quick-delivery inventory. For more information, visit http://www.ioxus.com.